Maria Sharapova overcame Briton Laura Robson and a partisan crowd on Number One court to reach the Wimbledon third round on Friday. The Russian former champion won 7-6, 6-3 but the 17-year-old Robson, world number 254, delighted the home fans by roaring into a 4-1 lead in the first set. Fifth seed Sharapova grew increasingly tetchy as the crowd sensed a huge upset but she fought back to force a tiebreak which she won 7-4. Left-hander Robson continued to produce the odd brilliant winner but she could not live with Sharapova's power and the Russian completed victory in one hour 48 minutes. 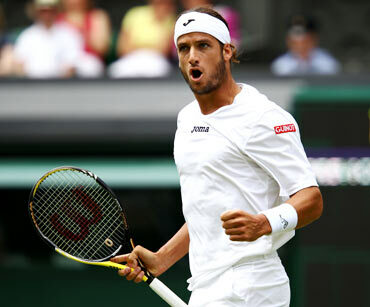 Three-times runner-up Andy Roddick was sent tumbling out of the Wimbledon third round 7-6, 7-6, 6-4 by Spain's Feliciano Lopez on Friday. The American eighth seed started in a fiery mood under rare south London sunshine, reeling off a string of aces but after an exchange of breaks in the first set he lost his way in the tiebreak. World number 44 Lopez took confidence from seizing the initiative and also shone in the second set tiebreak as the two big servers otherwise cancelled each other out on Centre Court. He sealed a famous straight-sets victory when Roddick fired wide. Roddick has become something of a Wimbledon fixture over the last decade and fans know exactly what they are going to get when they pay to watch the American number eight seed. The 28-year-old began his 11th successive assault on the tournament with only an outside chance of matching his three runner-up finishes in 2004, 2005 and 2009 but he was as committed as on his debut as he battered his way past tenacious German Andreas Beck 6-4, 7-6, 6-3. He was equally comprehensive in his second round win. At the England Club, twice he was unable to make much impression on the Swiss maestro, who had also beaten him in the 2003 semi-finals, but in 2009 he came agonisingly close before eventually going down 16-14 in the fifth set of a classic encounter. Top seed Caroline Wozniacki sped into the Wimbledon third round with a crushing 6-1, 6-3 win over Virginie Razzano on Friday. The Dane, seeking her first grand slam title, was never troubled on Court Two, overpowering her French opponent in all departments. Wozniacki sealed victory after 66 minutes on her fifth match point with a service winner. Wozniacki's previous appearance on Court Two resulted in a thrashing in last year's fourth round by Petra Kvitova but she had no qualms about returning to the same patch of turf. "I just go out there and I try to win. I'm a competitor, so it really doesn't matter. The court is the same and the size is the same. I just go out there and play," Wozniacki said, refusing to get drawn on whether a top seed should be exiled to the lesser courts. "If Serena can play on Court Two, then I guess I can too." Second seed Vera Zvonareva lost 6-2, 6-3 to Bulgarian Tsvetana Pironkova in the third round at Wimbledon on Friday. Pironkova gained some revenge for her defeat by Russian Zvonareva in last year's semi-finals with a clinical display in which she made only five unforced errors. The 23-year-old Pironkova, seeded 32nd, completed victory in one hour 17 minutes.